Named an "All America City" in 1995, Ocala is the county seat of Marion County. Known for its abundance of horse farms and surrounded by scenic countryside, shady forests, and crystal-clear waterways, Ocala is certainly a great retirement destination. The Ocala historic district has a neighborhood with lovely Tudor and Victorian style homes. Throughout the city and in nearby suburbs are newer developments of single-family homes, condos, townhouses and apartments. For those who long for the country life, Marion County offers many possibilities from newly built country communities to weathered farm houses, horse farms, and grand estates. The region's highway system makes outlying areas convenient to Ocala's business and shopping districts and residents are never far from schools, health care providers, churches, shopping and commercial centers, governmental services, cultural and recreation activities. The county is famous for its huge oaks, festooned with Spanish moss and the towering sand pines of the Ocala National Forest. Flowers bloom in every season of the year, filling the landscape with color and the air with their fragrance. The subtropical climate makes Marion County a vacation land year-round. Little wonder that residents spend as much time as possible outdoors. The above information can be found at the Ocala Marion County Chamber of Commerce website. Marion County is officialy the Horse Capital of the World. 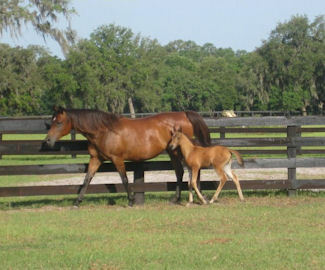 The County has the highest number of horses and ponies in residence in America. Anchored by the Florida thoroughbred breeding and training farms with more than 70,000 acres, Ocala/Marion County’s horse industry is represented by virtually every breed of horse. Horse lovers will enjoy local Horse & Carriage Tours, Trail Riding and Special Events. As of 2007, the population recorded by the U.S. Census Bureau was 53,491. The Ocala, Florida Metropolitan Statistical Area, had an estimated 2007 population of 324,857. The median income for a household in the city was $30,888, and the median income for a family was $38,190. The per capita income for the city was $18,021. As of the census of 2000, there were 45,943 people, 18,646 households, and 11,280 families residing in the city. The population density was 1,189.2 per square mile. The average household size was 2.29 and the average family size was 2.91. Information from Wikipedia. The Ocala Historic District, offers the opportunity to take a walking tour through stately neighborhoods of lovely Victorian homes. The Downtown area features a diverse and exciting shopping district located around the Historic Downtown Square. Additional major shopping areas include the new Market Street at Heath Brook open air mall and the Paddock Mall. Ocala National Forest offers 383,573 acres of unique ecological sites, trails, and natural springs. There are hundreds of camping sites throughout the forest, designated trails for horseback riding and specially marked walking/hiking trails. Hunting is permitted in designated areas. Fore Lake Recreation Area is a day use and camping area that is open year-round. A 250-foot sandy beach provides swimming and sunbathing opportunities. Fishing and boating in small, non-gasoline powered craft are allowed, and a fishing pier is at the southeast corner of the lake. Major annual events include: Fine Arts for Ocala's Ocala Art Festival; "God and Country Day"; the Ocala Christmas Parade; Ocali-Fest; Light-Up Ocala; the McIntosh 1890 Festival; Boomtown Days in Dunnellon; Belleview Founder’s Day and other smaller festivals and events. The importance of agriculture is recognized through other events such as the Florida Horse Park Festival of the Horse which occurs each April and features the finest horses and riders competing in dressage, cross-country and show jumping. Opportunities for fishing, boating, swimming and other water sports abound in a region covered by hundreds of fresh-water springs, lakes and the Silver, Rainbow, Ocklawaha, and Withlacoochee Rivers. Captain Tom’s Custom Charter Systems offers freshwater pontoon boat sightseeing and fishing trips on the Ocklawaha and Silver River. They also offer bird watching, moonlight cruises, dinner cruises, picnics and wonderful opportunities for photographers of every level. Call them at 352-236-0872. Visitors of all ages enjoy the 350-acre nature theme park at Silver Springs and the adjacent Wild Waters water park. Contact the park at (352) 236-2121. The crowning jewel in Marion County's multi-faceted cultural scene is The Appleton Museum of Art. The Appleton is open daily and offers tours, films, concerts, lectures and family programs. The Gift Gallery carries a wide selection of art books and art-related merchandise. For a current exhibition schedule call (352) 236-7100. 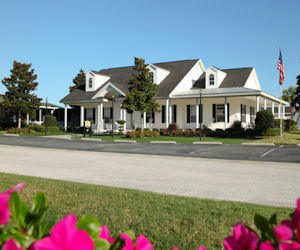 For more information on things to do in Ocala visit Ocala Marion County Chamber of Commerce website. Stone Creek, located in Ocala, Florida is one of the largest new Del Webb communities in the country. Stone Creek will feature resort-style amenities including tennis, an outdoor swimming pool with spa, a heated indoor swimming pool, a state of the art fitness center and a softball field. 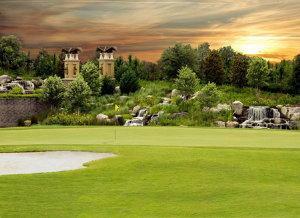 An abundance of lakes are planned to be integrated into our 18-hole championship golf course. Residents will enjoy walking trails and golf cart accessibility throughout this guard-gated community. 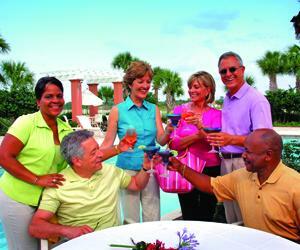 Fairfield Village is a lushly landscaped 55+ retirement community located in Ocala, FL. At Fairfield Village, you'll enjoy a peaceful neighborhood community with numerous amenities to keep you active at your own pace. Features include a spacious plantation-style clubhouse with a heated pool and spa, Shuffleboard, a Billiards Room, Fitness Room, and Media Room. At SummerGlen, located in beautiful Ocala, FL we proudly offer the best in over-55 adult living in our resident-owned retirement living community that is fun, carefree, affordable, and secure. 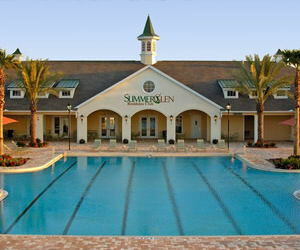 SummerGlen provides Florida retirement living at its best complete with 18 hole championship golf course, health club quality fitness center, heated beach-entry pool, full service restaurant, and outstanding facilities for recreational and social activities. Homes are affordably priced from the $150's. On Top of the World is an active-adult community for the 55-plus resident located in Ocala, FL near the Ocala National Forest. Here you will find resort-style amenities with hundreds of activities including golf, tennis, swimming, clubs and organizations, shows, dancing and more. On Top of the World offers 13 energy-smart home designs priced from the $130s, built with the highest quality construction featuring unlimited ways to customize. Residents will enjoy three 18-hole, par-72 championship golf courses, a lifelong learning program that boasts its own education center, and 200-plus resident clubs and organizations.